Add a layer of protection against malware with on-demand scanner Malwarebytes' Anti-Malware Free. You can't depend on just one program to protect you from rootkits, Trojans, viruses, worms, and other malicious code. The job is too important and the villains too numerous for that. So supplement your regular antivirus program (the one you keep running in the background at all times) with an extra malware scanner, such as Malwarebytes' Anti-Malware Free. Malwarebytes' Anti-Malware scans for and removes viruses, worms, and other undesirable code. 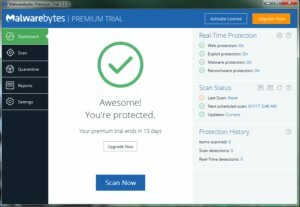 The free version of Malwarebytes' Anti-Malware doesn't offer real-time protection (the $39/year full version does), making it useless as your first line of defense. But scanning your hard drive with the free Anti-Malware every week or so will add another layer of protection, finding whatever your main program missed. It's like going to another doctor for a second opinion, except that you don't have to make an appointment or a co-payment. Malwarebytes' Anti-Malware Free is extremely easy to use. You load it, check for updates at its prompting, then start the scan. To scan just one drive, file, or folder, right-click it and select Scan. Not a complete solution by any stretch of the imagination, this version of Malwarebytes' Anti-Malware is a free yet valuable addition to your security arsenal. Editor's note: This article was orginally published February 8, 2010, and updated December 9, 2016.